Well there you are big shooter. You have at this point handloaded ammo that is as near perfect for your rifle as possible. But before you run'd oft to the match, let's inspect the run out of the bullet to the case. That means we want to check to make sure the bullet is inline with the case perfectly. The technical term is that the bullet is -concentric- with the case. So we place our loaded round on the gage with the point of the indicator about 1/8" or so back from the meplat and zero the dial. Now we SMOOTHLY rotate the case 360 degree's and watch for movement of the needle on the dial. 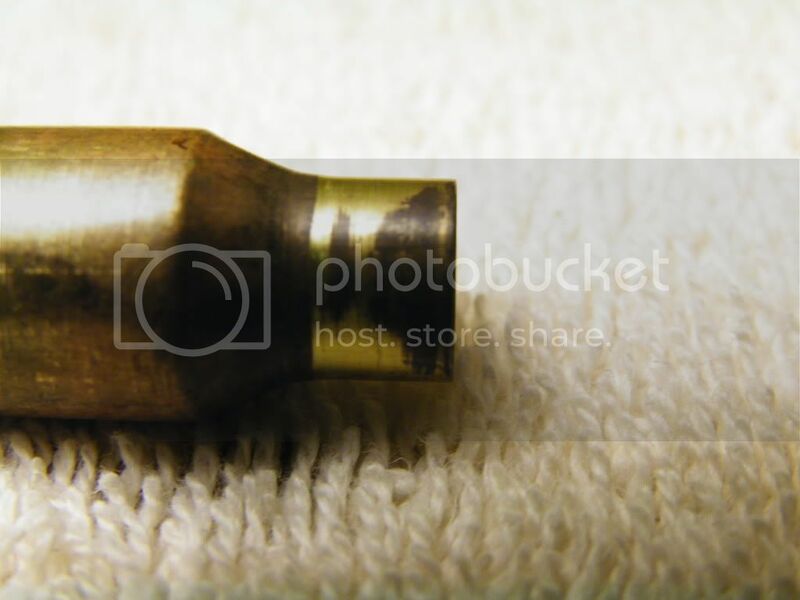 If the bullet is perfectly inline with the case the needle will not move off of zero. We can allow up to .002" of run out for purposes here. But less is better. So what happens if our bullet is not concentric to the case? It will swage, or "engrave" to the bore misaligned. In this condition as it travels down the bore the meplat will not rotate on axis, rather it will orbit. (if the tip of the bullet had a felt tip pen point- it would not make a spot on theoretical paper, rather it would draw a circle.) In this state it will take the bullet all the more down range acreage for the bullet to stop yawing, if it stop yawing at all! 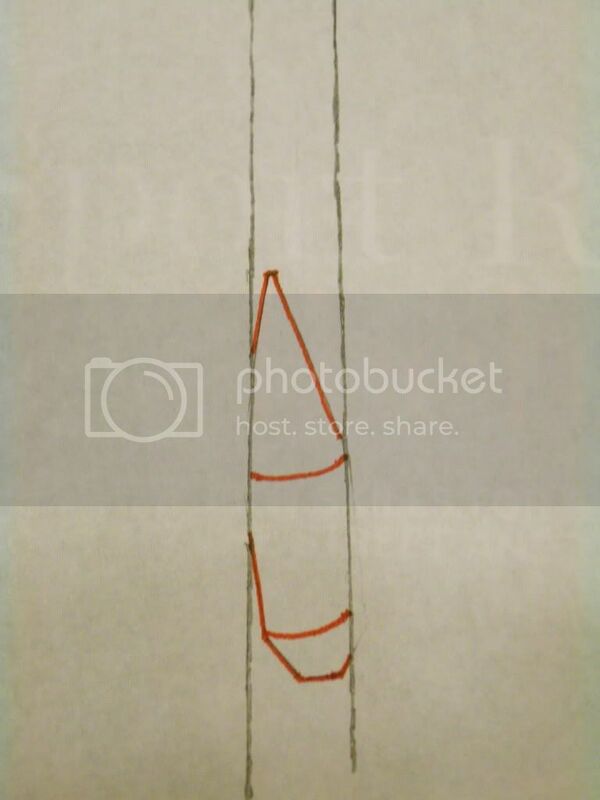 Not to mention the bore has now reshaped the bullet to an unbalanced profile. A technique that can sometimes help reduce run out is while seating the bullet, seat it about half way. Then rotate the case 180 degrees in the shell holder and seat the bullet fully. As I mentioned in the first chapter and throughout this whole series we need everything to be perfectly consistent load to load, shot to shot. In Chapter One of Hand Loading for Long Range we discussed weight sorting brass. 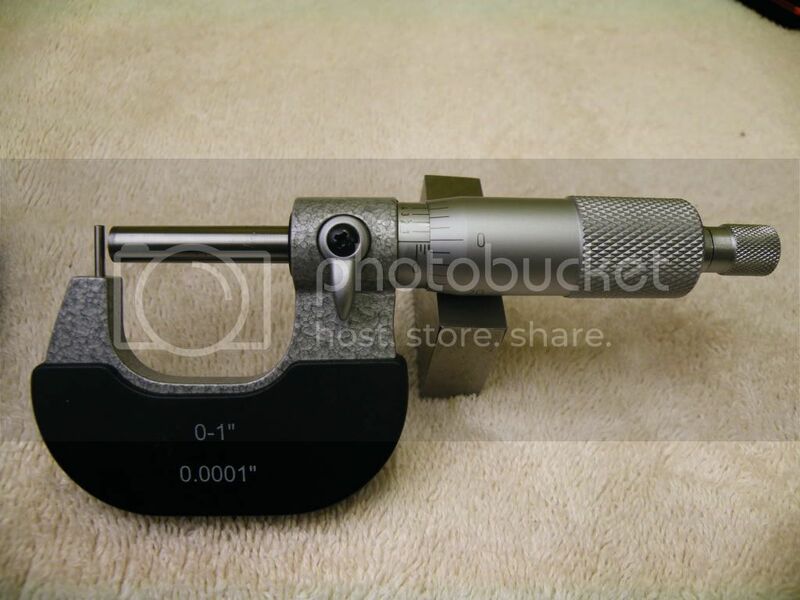 Here, if a loader wanted to move up a tier in precision they can pick up a set of neck wall micrometers, or know in the general industry as a tubing micrometer. So with our tube mic we can measure the thickness of the wall in many places to check for run out in wall thickness. Any cases that vary much should be culled and set aside for sighter shots or fouling shots. Good brass should not have a lot of neck wall run out. Winchester & the premium stuff (Lapua, RWS, Norma) in my experience is generally okay for our purposes here, but do check you will find a nonconformist or two. The ultimate treatment for neck walls it to turn them. That is to use a small affordable device to actually machine them to, or near to perfection. Here's a picture of my Forster case trimmer, with a neck turner installed on it ready for action. I personally find it easiest to just throw ALL my cases on the neck turner and turn them and visually SEE how the neck variation is after I take a "skim cut" opposed to doing a lot of careful and meticulous micrometer work. I like to keep my neck turner set to cut ALL my case necks to one specific thickness (for a particular caliber.) 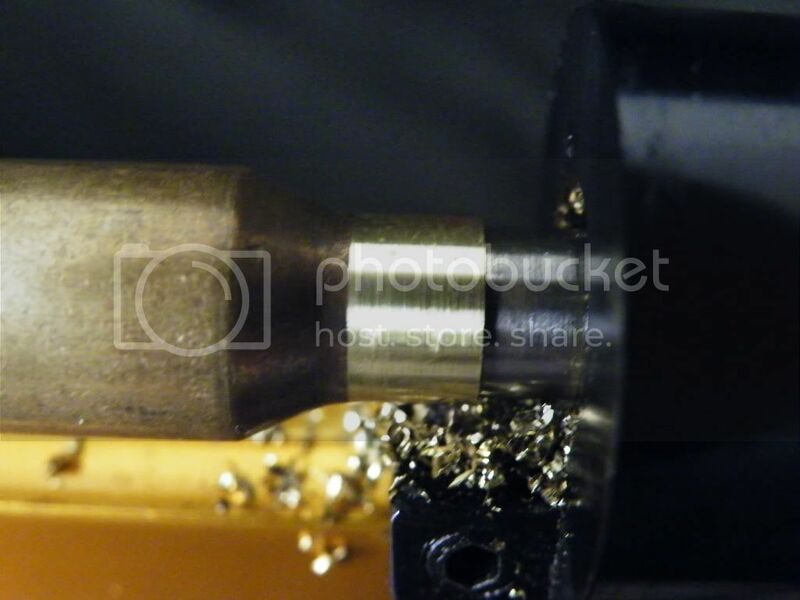 My turner has a carbide cutter that will practially never wear from cutting cartridge brass. I set it once and leave it alone so long as I'm working with that caliber- though I do measure the outcome of the turned necks every few cases to make sure consistency is maintained. So what is a "skim cut?" Benchrest shooters often turn the neck to a specific and critical dimenson in relation to the neck size of their chamber and of course get 100% clean up. The two literally are and go together like a machined parts. But for our purposes here, we just need to level the surface of the neck by cutting off all the high points so we get a consistent wall thickness for consistent neck tension & consistent release of the bullet. I adjust my neck cutter so that I get an average of 90-98% "clean up" on a dozen or so randomly picked cases. That is to say I set it to cut about 95% (average) of the surface of a given neck out of the whole lot of brass. This creates consistency without making the necks so thin that with the rough and tumble activity of being in the field that our bullet does not get knocked off centerline/ out of concentricity of the case. Sure we could cut more for 100% clean up, but at a great loss of neck strength. And we just bought a gauge to make sure they are concentric! You can see the part that did not get cut. This quickly & easily identified the low spots on the surface which is where the neck wall was the thinnest. Yes, careful work with my tube mic would have shown the same, but I like the "cut & look" method as to me it is a "no brainer." As far as this case- for how I turn & cull my necks I'm on the fence with this one. I think.. I feel... that I wish just a teeny bit more of that dark area had cleaned up. I'm gonna call this just under my 90% clean-up minimum and set this one to the side as a second string case. My first string cases go to X-ring score type paper shoots. My second string cases (and second string components go to "hit or miss" steel type shoots. My third string stuff is to foul a clean barrel and to smile largely and say yes to the stranger that walks up and says "wow, can I shoot it?" You need to know your brass is crawling around on you. I have read repeatedly in my search and studies about this topic that brass, especially when not annealed is looking to free it's strains. This effects us because it means brass will change dimensionally on you behind your back without permission. For instance- let's say you have half a box of fired brass, and half a box of resized and deprimed brass. Your all fired up by this neck turning info and are about to go at it. Well the first thing you need to do is resize your brass or at least run the mouth of it over a standard expander ball so it will fit the mandrel of the neck turner nicely & consistently . So you think "Ah-hah! I'm half done- I resized half my cases last week while I watched the A-Team on TV. " So you resize the other half of your brass and now your licking your chops at the neck turner.Stop, STOP. No so fast. Most likely the necks of those cases that watched the A-Team with you & dreamed of being fired in a mini-14 by BA have now shrunk, when thinking in (.0001") Ten-thousandth's of 1 inch. So we want to measure and maintain our neck dimension case to case to case in the <span style="text-decoration: underline">.0002</span>- .0003" range. This is not possible if our case neck do not START OUT the same size. So resize ONE case, then immediately neck turn it. If you already have all your cases resized- no problem. Advance the expander ball of your die down as far as you can and just run the mouth over it prior to neck turning. There are internet recipes for neck turning lubricant. I personally use and never have been dissatisfied with Imperial Sizing Die Wax lube when used on the mandrel and neck prior to turning. Here's some Penny-tech tips that can improve your handloaded ammo. Go to your local ACE hardware and buy a #27 rubber o-ring for each of your individual die bodies wether a sizing or seating,die. 1 per. If you don't have an Ace, your looking for 7/8" ID rubber o-ring. I like the heavier walled ones. Back at home put a rubber O-ring on your die so that when the die is threaded into the press the rubber ring is sandwiched between the press and the lock ring of the die. Yes, you'll have to readjust the lock-ring and the die in the press in general. When you get the lock-ring/die set back up at the proper position in the press, you want the lock ring to be just BARELY snugged against the rubber. What this does is allow the die to have just a tiny bit of play in the threads of the press so that any misalighment in the machining of the press, die, ram or shell holders can be compensated for by the now "floating" die set up. Now pull that wire clip off of the ram on your press that holds the shell holder in place. Install the smaller rubber o-ring around the ram to hold the shell holder in palce. This lets the shell holder "float" to compinsate for misalighment as stated above. Sorry for the exceedingly low picture quality. My camera perished and I only have my cell phone cam now. Will the higher end seating dies (Redding, Forster) decrease the risk of run out? Also, your artistic ability is plenty good for around here. Yes higher end dies will help prevent run out. thanks for this post. 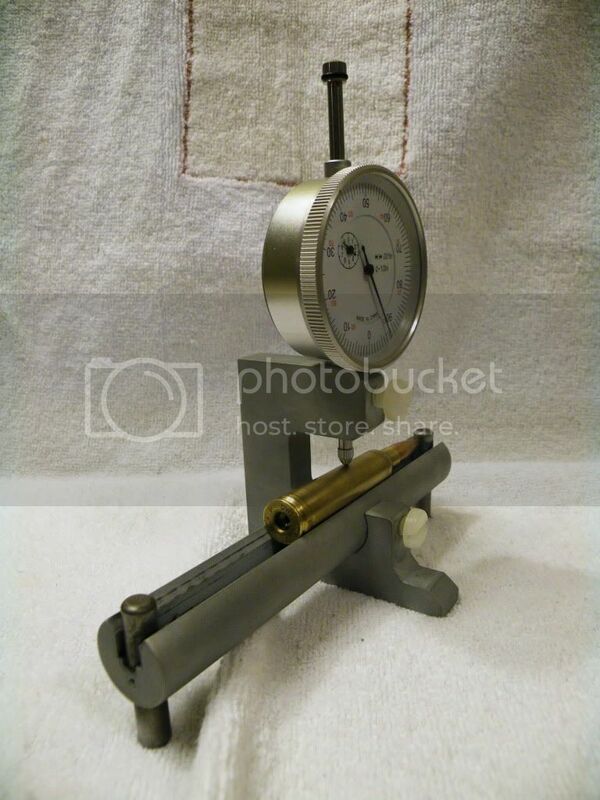 i think i can set up a gauge with an old starrett indicator i have from when i used to do machine work. ill be interested to see what ill find with my loads. guess its one more ocd check to add to my current list,lol. Added another tip to the top original: Neck turning. <div class="ubbcode-block"><div class="ubbcode-header">Originally Posted By: bosulli</div><div class="ubbcode-body">Will the higher end seating dies (Redding, Forster) decrease the risk of run out? Hugely. With a wobble die I could get upto 5 thou runout from a case with 1 thou runout, and no matter what I did I could not get consistent performance. while my redding die probably only adds 1/2 to 1 thou runout and sometimes reduces it. Personally I use a Lee collet die and a redding seating die for my 308. Collet die 'cos its cheap and seating die 'cos I couldn't get anything else to work as well. Good post. One quick point. I don't know if that case you show was neck turned just for the purposes of this post or not; but you should turn the neck down a little closer to the shoulder. Especially if you are using a bushing type sizing die (or any die without an expander). Otherwise you're going to end up with a thicker brass "ring" on the inside neck, at the base of your projectile. That will cause, rather than reduce run out. Cases should be turned until you just hit the neck shoulder junction, then cut a further ~.005" into the shoulder to allow for stretching. It's also a good idea to anneal the case afterward if it's already seen use. Yeah- that was an "Estate" brand (??) case I turned for the post. WOW! Tres, thanks for the wealth of information. It is priceless. I've had many questions answered by reading your series. I need to print every chapter, laminate them, and keep them next to the rest of my hand loading documentation. These 5 threads have more information than you can find on most "shooting" sites. Thanks for taking the time to spell it out for those of us that are less experienced. Just wanted to add my thanks. I'm getting into reloading with nobody to show me how and these posts are great. Much clearer than all the books I've read to far. I put them in a binder and have them by my reloading bench. I'd like to add my thanks for this. And great pics. Yup, adding my "Thanks" too. Information comes from so many sources that it almost adds up to trial n error. Having a step by step written in a place like this with plenty of qualified folks to call 'foul' if foul it is, makes this a solid piece of valuable information. WTG Tresmon. 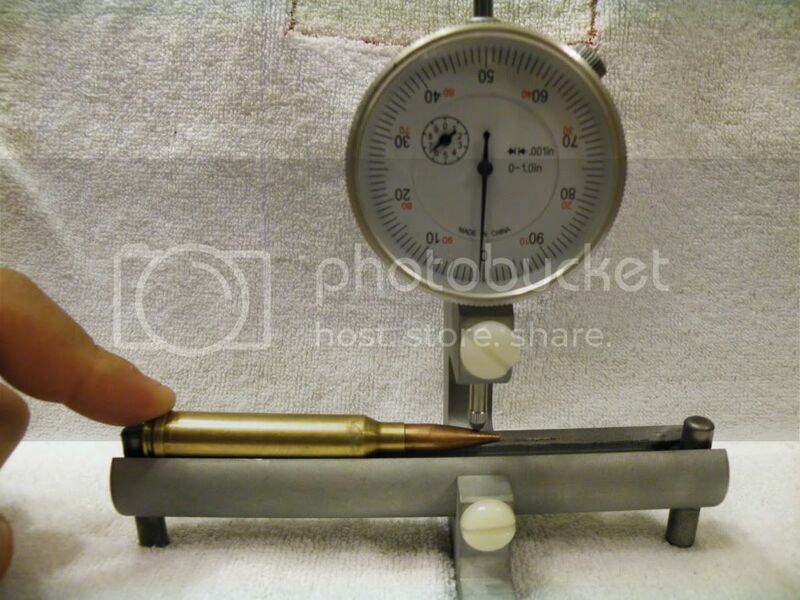 I also use a runout-gauge to check for straightness, however, I've found that Molly coating is another way to deal with run-out...Besides lowering/broadening the pressure curve, molly tends to allow bullets that enter the throat cockeyed, to straighten themselves out in the barrel. This allows them to stabilize sooner, so your 100yrd groups improve. The biggest problem, is because it lowers/broadens the pressure curve, the velocities drop significantly. As there is little reloading information available, you need to proceed VERY CAUTIOUSLY BEYOND the load maximums to achieve "normal" velocities. Tres, I just want to start by saying WOW, this is by far the clearest and most knowledgeable instruction on building up a hand load I have read. Quick question, at which stage do you turn case necks, after depriming and cleaning or before annealing? Quick question on concentricity guages. I know that concentricity guages will measure run-out - but WILL NOT correct the problem. But I have seen that the HORNADY LOCK-N-LOAD concentricity guage has a feature to correct this run-out. So here is my question: Should we find the cartridges with non-acceptable run-out and seperate them, or should we use the Hornady feature to correct this runout? I am asking because I would think that the process of correcting the runout would mess with the neck tension...which is an absolute "No-No". Just wanted to hear your thought. (And maybe get a recommendatioon for a decently-priced concentricity gauge you could recommend...and why. (RCBS, Hornady, NECO, etc...). Shouldn't your 'run out tool' be measuring while the cartridge is resting on the neck? If your laying the whole cartridge on the "V-block", anything such as case dings, oil/lube dents, or even a small gouge on the belt of the cartridge will transfer to the dial. Giving a false reading....or am I wrong? How much would you charge to make me a gauge like that? I'd be happy to make you one if I still had unlimited access to the machine shop but I'm currently laid off. Sorry bud. I have no personal experience with the Hornady tool you mentioned. However I agree with you and think it would tend tweak the neck of the case and perhaps create case neck tension variables. However I feel the "CAT" tool off the Neco website would be a perfectly fine solution. you asked the wild card question; best I can tell pose that question to 10 BR shooters and you'll get 13 opinions of at what stage to do it. I added another great tip into the original article. It's at the bottom of the original write-up. Absolutely priceless information. I have read all five of your instruction threads and still trying to figure out how someone so intelligent can talk in a language that I can for the most part understand. I wish I had met someone like you a longtime ago. This information if put to use will , in the long run, after buying the equipment needed, save lots of money later on. Glad to help! Thanks for the kind words. there is allot of information here in these notes. I have read them twice now. This information is filling in many of the gaps I have had in handloading. I will no doubt be revisiting these in the future. Not to be picky but you should not measure runout that far up the bullet, you should measure it at the ogive. This will give you a true indication of the runout, not an amplified measurement. Keep in mind the ogive is what contacts the bore. I also would like to agree with the comment about turning up on the shoulder just a bit to prevent the "doughnut". I modify my cutters with an angle at the end to keep from cutting too deep in the shoulder, but still allowing to turn the entire neck. Very good post, just wanted to shair my thoughts. However I like to measure the "amplified run out" because if their is little to none near the meplat, you no there's next to none at the bearing! 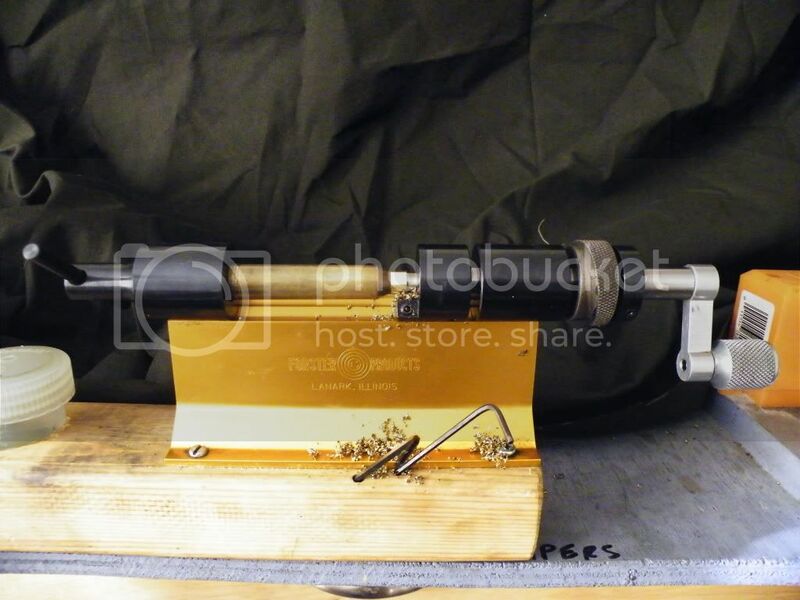 I have loaded quite a bit of stuff that I use at benchrest shoots, and in my estimation a one thou. indicator [such as the one in the photo] on a run out guage isnt really doing the job. If you want to see just how true your ctgs. are a one tenth guage is all but a necessity. I also feel that Tresmons pick of neck turners is a very poor choice. The Sinclair type turner is a far better choice for keeping neck walls consistant, the idea of holding a case in an electric screwdriver in one hand and the turner in the other hand is a much better option than any of the lathe type neck turners, I have tried them all and havnt found one that will compare with the hand held type. The sense of feel that the average person has is greatly underestimated. The biggest promlem with the Sinclair type is setting the cutting depth to start with, but a mic. head can be adapted to set the depth of the cutter with very little trouble. Even with the best set up if you can hold the wall thickness to within two to three tenths you are doing a very good job. Ijust reread my post and realized that it could be taken as a knock at Tresmon, which it most certainly is not. He is obviously a very knowledgeable guy and has a lot of great information, I just thought I would throw a thought or two of mine in that have served me quite well over the years. Sorry for any idea that I was putting anyones ideas down. I had a question regarding your use of o-rings to maximize concentricity: on my Lee press, I had difficulty determining where the o-ring on the shell holder should go. I was unable to find an o-ring small enough to fit in the space between the shell holder and the ram and I'm guessing that simply wrapping the o-ring around the ram (where it replaces the spring) doesn't address the issue. Any suggestions or better pictures? Thanks again for your huge contributions to improved accuracy for those of us who are new to reloading! Tresmon you are awesome! I have been reloading for a long time and read a lot of books on the subject a lot of different perspectives out there but you gave great explanations of why which is helpful...Thanks for all your efforts great job. On another note what is everyone opinions on gracey power trimmers? The rubber ring is a great idea! Recently I bought a similar device made by John Whidden and sold at unique tec where John make a floating die that is cnc machined for Dillon re reloaders. interesting write up. I like it. I have the Forster Co-Ax press. I'm assuming I would not need a O-ring. Is that correct?